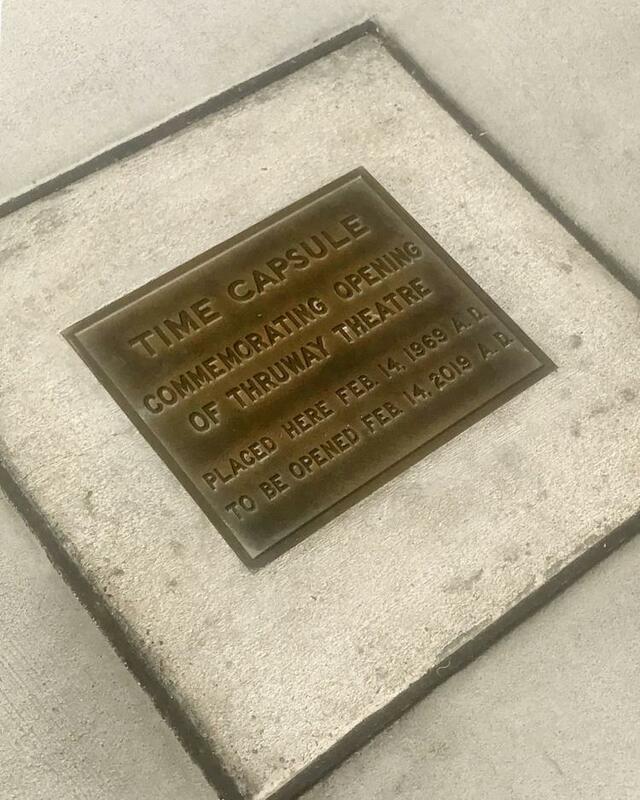 The capsule was buried on Feb. 14, 1969, to commemorate the grand opening of Thruway Theatre. The plaque on the capsule says it is to be opened on Feb. 14, 2019, but the grand opening celebration is actually being planned for two days later on Feb. 16, a Saturday, to allow more people to attend. The time of day is still being worked out. The theater is long gone, but the plaque and the buried time capsule remain in the sidewalk in front of the FastMed Urgent Care clinic. Saul Centers LLC, the owner of the Thruway center, and the Thruway Merchants Association are working out plans for a grand ceremony, along with radio station WTOB 980 AM/96.3 FM. WTOB announcer George Lee was the master of ceremonies for the 1969 event, back when the radio station was based above the Town Steak House next door to the theater. Lee’s daughter, Kim Brown, who was 7 when the time capsule was buried, said she hopes to be there for the grand opening. “I believe that my dad let me put a picture I drew into the capsule,” she said. Since she was so young, she isn’t absolutely sure, but she’s optimistic. The capsule also contains predictions from prominent figures of the day, including Mayor M.C. Benton, about what life was going to be like in the then-distant future of 2019. Fifty years later, WTOB — which is now based on Trade Street downtown — will once again lead the festivities with a live remote and local dignitaries. Hauser is arranging sponsorships and talking with experts about how to open the capsule without damaging the sidewalk. “I’ve looked at that thing, and I don’t know how to open it,” he said. He is also setting up plans for an a capella group from R.J. Reynolds High School to perform, and looking for people who attended the original event. Dewey’s Bakery, the only merchant still at Thruway that was there when the capsule was buried, will likely be involved. After taking out the existing capsule, Thruway plans to bury a new one in its place, to be opened in 2069, said Paul Bledsoe, a spokesman for Saul Centers. They are using the “Revive the Thruway Theatre” Facebook page to solicit suggestions from people about what items they should include in the new capsule.